Progress reports were sent home today. Please review, sign, and return then tomorrow (April 29). The back of the progress report has information and a permission slip for the upcoming musical. Don't forget to sign this, too. Just a reminder: all work (including 4th term assignments and any Compass Learning assignments given by me this year) is due by Friday, May 15. Any student who does not have their assignments competed by that day will have a study hall at school instead of attending field day in Daffin Park. Please let me know if you have any questions. Congratulations on making it through the first week of the GMAS gracefully! I appreciate your hard work and your willingness to "show what you know" on this important test. We will continue the GMAS this week with science on Monday and Social Studies on Tuesday. Makeups for absent students will take place Wednesday. The rest of the week will be devoted to preparing for the musical! I will send the following letter home with you this week. Please return it as soon as possible. We will finish up the script this week. After that we can audition and cast the play. Our prop, set/scenery, and costume committees can also get busy. Progress reports will be sent home this week. Please share them with your family. They must be signed and returned the following day. All work is due Friday, May 15. This includes all choice work, classwork, and homework from the first term. Also, please be sure you have completed ALL of your Compass Learning assignments. Once you have, let me know and I'll check you off my list. All of this work must be completed for you to enjoy Field Day at Daffin Park on May 15. Please feel free to use the following video resources as you prepare for this year's musical. Ms. Carol's homeroom will be doing "Pre-Ice Age Humans" (Video Part 1) and Mr. Trent's homeroom will be doing "Post-Ice Age Humans" (Video Part 2 & 3). The 4/5 classrooms will each do a section of the Fundamental Needs of Humans chart. The first week of the Georgia Milestones Assessment is here already! There's no need to be nervous, the is just another way to show what you know. We will touch base Monday to make sure that all your questions are answered about the test. For the rest of the week, you just need to come to school well rested, well fed, and ready to do your best. More information about the test (as well as the daily test schedule) can be found by clicking on the "GMAS Info" button above. This week we will also be starting work on this year's musical: Charles Ellis Presents- The Story of Humans and Their Fundamental Needs! The show will take place in the Ellis schoolyard Wednesday, May 13. Since the show will be presented outside, we will have a rain-date of May 14. I'm so excited to begin this project with you! The musical is always a highlight of the year, and a wonderful way to share the Montessori Great Lessons with our friends and family. 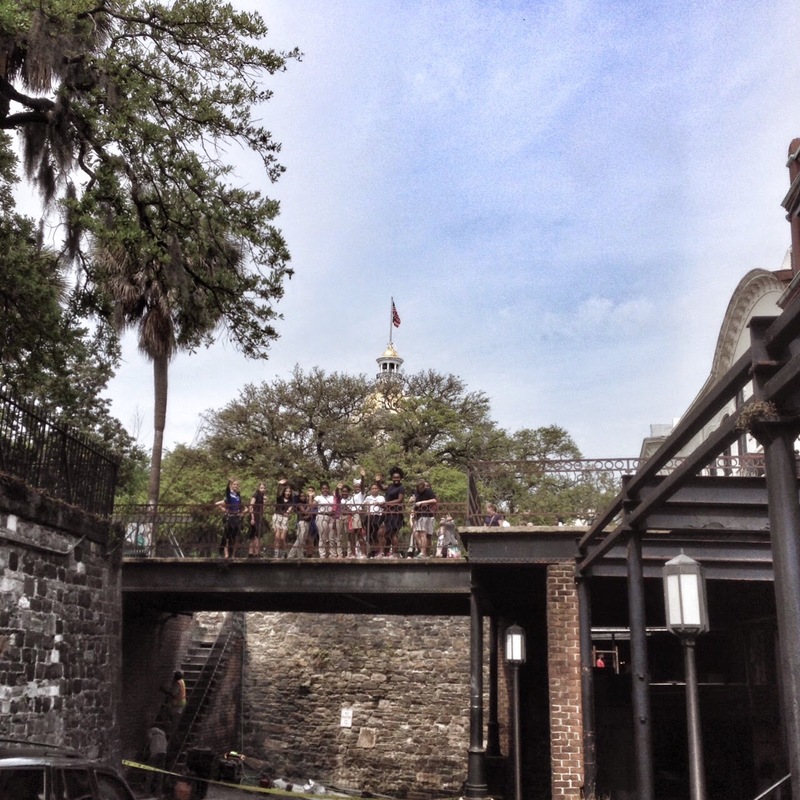 We had a pleasant day walking along the Savannah River learning about its importance to our city. Thank-you to the people at Massie Heritage Center for giving us a great tour of our hometown! We will be taking a FREE field tip to River Street to study the cultural, economic, and geological effects the Savannah River has on our city. Please complete and return the permission slip by Wednesday morning to attend. I trust your Spring Break has given you some downtime to refresh and build up enough energy for one last push until the end of the school year. This week is shaping up to be action-packed! This is our last week before the Georgia Milestones Assessment, so we will spend our time together continuing to review and "brush-up" on topics we've discussed this year. You will have plenty of opportunities to review these concepts in class. You will have homework due Monday and Tuesday night, as well as a Compass Learning assignment due Friday. This will help you prepare for a review quiz on geometry Thursday. Don't forget that your PIN folder is a great resource you can use to help you review. Math tutorial will take place Tuesday and Thursday from 3:15-4:00. This week's science lessons will involve a review of the four branches of Earth science: geology, oceanography, meteorology, and astronomy. Each of you will get a topic about which you will create a short 5-minute presentation. Your presentation will help your classmates remember what we studied about your topic. You will have all week to prepare, and the presentations will take place Friday. Here is the rubric and planning sheet you will use when creating your presentation. Finally, don't forget that Friday is a dress-down day for $1.00. All proceeds will benefit Relay for Life. Over Spring Break I've had the opportunity to visit Greece! During my time in Santorini and Athens I came across so many examples of things we've studied this year...I really wish you were along to see them for yourself! While on the island of Santorini in the Aegean Sea, I took a boat around a volcano that is still growing by 15 cm a year. The surrounding islands were actually part of one central volcano. The volcano erupted about 3,600 years ago causing it to collapse in on itself creating the circular island group seen today. The landscape is a mixture of lava rocks. I've brought some home for our science shelf. We can even give a bit of pumice to Georgia the chinchilla for her dust bath! The side of Santorini that does not face the volcano is made up of beautifully terraced farmland. The farmers have terraced the land to help fight the effects of erosion. The stepped landscape keeps water from rushing down the hillside and washing the precious topsoil away with it. Farmers their land on the Island of Santorini to prevent erosion. In Athens, the capital of Greece, I spent some time exploring the ancient ruins located on the Acropolis. A major reconstruction effort is happening to save one of the most famous temples found there, the Parthenon. Thousands of years (it was completed in 432 BC) of weathering has damaged much of it. Slowly but surely this breath-taking building raising above the city once again. Here I am admiring the weathered ancient wonders of the Acropolis in Athens, Greece! I also enjoyed a few hours wandering the Acropolis Museum. I thought that ancient Greek statues were simply intended to be beautiful white marble, but now archeologists are finding that some were painted beautiful colors by the artists who created them! The paint used on these sculptures was created using ground up rocks and minerals like azurite and malachite. Perhaps you may wish to make some of your own paint from rocks...HERE is one way to do it. I hope you are enjoying your Spring Break as well! I can't wait to hear how you spent your time off...especially if you came across some unexpected examples of science (or math) concepts we've studied. Enjoy your much deserved time off for Spring Break! I'll see you again Monday, April 13. Please take note of the following dates for the upcoming GMAS test. More information about the test can be found here. Khan Academy is a great resource you can use to practice your math skills. It provides video lessons and interactive practice opportunities. Here is an online lesson that reviews graphing inequalities you may wish to use as you review this important topic. A group of brave crew members just arrived at the International Space Station for an unprecedented year-long mission in space! Check out the article HERE. For a real-time view of the location of the International Space Station, check out this awesome website from astroviewer.net. You can also see when the ISS will be visible in your location. 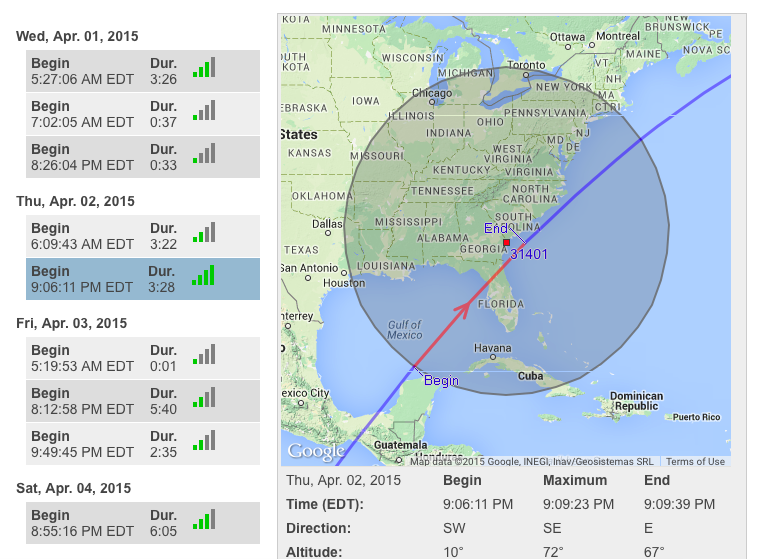 It looks like the best time to see the ISS in the near future is Thursday, April 2 at 9:06 pm. View the location and best viewing times of the ISS!